It cleans, disinfects, and deodorizes surfaces by killing odour-causing microorganisms and prevents the growth of mould and mildew. Its non-abrasive formula is designed for use on: glass, glazed ceramic, restroom surfaces, glazed tile, glazed porcelain, chrome, stainless steel, and plastic surfaces associated with floors, walls, fixtures, toilets, urinals, sinks, shower rooms, and locker rooms. Clorox. Clean-Up. Disinfectant Bleach Cleaner is designed to quickly and effectively clean and disinfect a variety of surfaces both indoors and outdoors. It removes tough kitchen and bath stains, grime and dirt on contact, while killing 99.9% of germs. This household cleaner can be used on multiple hard, nonporous surfaces throughout your home, including kitchen sinks, counters, refrigerators, appliances, tubs, toilets, fibreglass, floors, showers and tiles. And with its Smart Tube technology you are guaranteed to spray every drop. The easy to use trigger lets you spray into corners and hard to reach places. This cleaner leaves your home sparkling clean and smelling fresh. Clorox. Clean-Up. Disinfectant Bleach Cleaner gets the job done. All-purpose lavender cleaner leaves your home shiny, clean, fresh and fragrant. Removes tough dirt and leaves a long-lasting fresh scent. Effective for a wide variety of cleaning applications. Cleans floors, walls, kitchens, food service and restrooms. INVISIBLE GLASS cleans glass so well you'll think it's invisible! Other glass cleaners contain water and inexpensive soaps, which remove dirt, but leave "streaky" residues that are nearly impossible to remove. INVISIBLE GLASS won't streak, evaporates 100%, and contains NO soaps or foams. INVISIBLE GLASS removes tough dirt, dust, sap, droppings, bugs, fingerprints, smudges, smoke haze, plasticizer film, and other grim that soap and water can't remove. Simple Green All-Purpose Cleaner is the effective, economical and environmentally-sound solution for powerful cleaning and degreasing. The trusted formula is recognized by the U.S. EPA's Safer Choice Program as safer for people, pets, and the environment. Safe for use on all washable surfaces, the non-toxic and biodegradable formula easily removes tough dirt and grime without the use of harsh chemicals. The concentrated formula provides up to 30 times the cleaning value. Use it full-strength for heavy messes or easily dilute it with water for daily cleaning. Removes built-up dirt, grease, food spills, ink, pet stains and other tough grime indoors and out. For use on floors, carpets, walls, countertops, appliances, furniture, fabric, tools and more, this versatile all-purpose cleaner can easily replace a cupboard full of harsh cleaners, detergents, degreasers and laundry pre-soaks, making clean-up simple and safer. 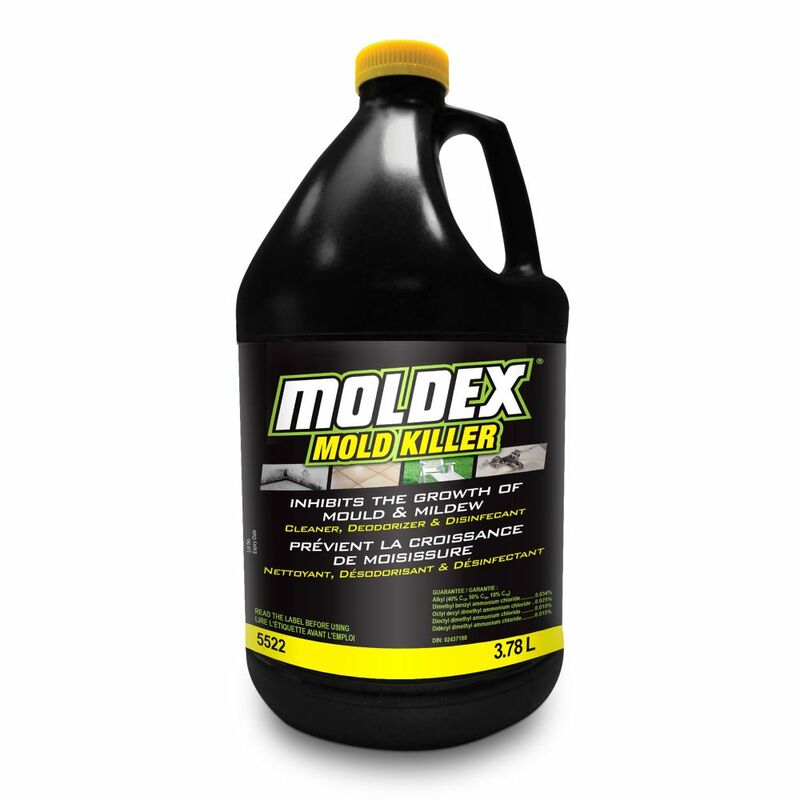 Mold Disinfectant Cleaner 128oz It cleans, disinfects, and deodorizes surfaces by killing odour-causing microorganisms and prevents the growth of mould and mildew. Its non-abrasive formula is designed for use on: glass, glazed ceramic, restroom surfaces, glazed tile, glazed porcelain, chrome, stainless steel, and plastic surfaces associated with floors, walls, fixtures, toilets, urinals, sinks, shower rooms, and locker rooms.